Objectives: Hypertensive disorders in pregnancy with incidence of 3/7% are one of the most severe complications. Cardiovascular diseases are apparent in 2% of the pregnancies. Physiologic changes during pregnancy intensify the underlying disorders and the severity of this problem. Researches indicate that pregnant women with heart disease greatly confront unfavorable maternal and fetal outcomes with increased risk of abortion, intra uterine fetal death, preterm labor and intra uterine growth retardation. This study aim was to magnify the outcomes of pregnancy accompaniment with cardiovascular diseases and hypertension. 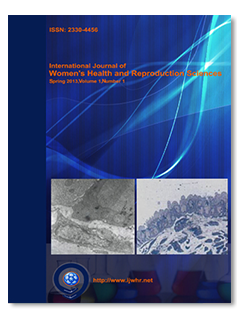 Materials and Methods: This is a retrospective descriptive study in which patient records of 2500 pregnant women referring to Alzahra hospital from 2006 to 2008 were assessed. Data was gatherated by medical files and analyzed by SPSS soft ware. Results: In this study incidence of moderate Aorta Stenosis (AS) was about 45.5 % (10cases), Mitral valvuloplasty (MVP) was about 22/73% (5cases) and Mitral stenosis (MS) was 18/18% (4 cases); two patient with MR(mitral regurgitation)+MS had underwent valvuloplasty. 72/7% (16) of the mothers were hospitalized due to hypertension, 9/1% due to tachycardia and dyspnea and 18/2% showed mixed form of theses complains. They were using hydralazine and methyldopa as anti hypertensive drugs. Only 10% of the patients had history of anticoagulant using during pregnancy. We found only one patient with pulmonary stenosis (PS) in these patients. Conclusion: Women with hypertension and previous heart disease showed many serious complications and high fetal mortality during pregnancy. Proper and on time care giving and support during pregnancy is dependent on the accurate diagnosis of the heart disease; any health problem should be seriously noted.